We’re trying something different and having our trail race on a mid week evening! Your race entry fee will include a post race meal by Sticky Rickys food truck. and $5.00 beer in addition to finishers medals and tri-blend t-shirts. Register by April 15 and the first beer (or cider) is on us! With three distances, this is a sister race to Spring Trio 5/10/15km, otherwise known as the run the bridges version. Choose from the 3.2 km, 5 km or 8 km trail distance. The 3km is a great intro to trail running if you’re new to the trail. Single track and elevation for all three distances with more of both the further you go. Don’t miss out on this fun mid week trail race within city limits. Finishers medals for everybody. If you do Spring Trio and Spring Trio Trail, you’ll find that your medals fit together. People doing both races will also receive an extra “double header” campfire mug. 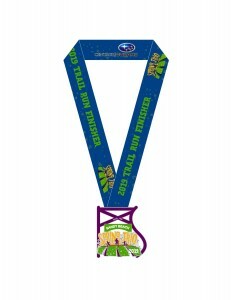 There will be medals for the top three men and women under 40 and 40+ in each distance.